Introduction: The idea that a massive trade in Slavic slaves underpinned the economic growth of Europe in the 9th and 10th centuries is not new. It is, however, most often only implicit; and at any rate, it is very rarely discussed. Even though this was an obvious idea to the 19th-century Orientalists, the interest in slave trade gradually faded away, and virtually disappeared in the 70s and 80s. Recently, however, the concept of a large-scale slave trade that allowed the Western European economies to emerge from the Dark Ages has resurfaced in the Anglo-Saxon scholarship. Voiced emphatically by Michael McCormick ten years ago, it was readily accepted in a number of recent syntheses; but the reaction on the Continent was less enthusiastic. The debate which was thus reignited has already led to some progress, but – as can be seen from a map of Michael McCormick – there are still some gaps to fill. The key area for the understanding of the mechanisms of the medieval slave trade has been disregarded. As the word “slave” indicates, no such study can be complete without an effort to understand what was happening in the Slavic lands. And this is not any more a vain pursuit: the archaeological material accumulated in the last 20 years allows a foray into this still virtually unexplored area. The objective of this paper is to get a sense of how the trade in Slavic slaves operated, of its scale, and of its impact. I will use the numismatic evidence and written sources as a starting point for a risky interpretation of the archaeological material. Dirhams are good quality silver coins weighing on average 2.9 g. What makes them an invaluable source for a historian, is the inscription of the place and date of their minting. As opposed to early medieval Western European coinages, where a significant effort is needed to establish general chronological outlines, Arabic dirhams provide absolute and usually exact datings. We can thus follow in detail their flow into the Northern Lands, where they are found in large quantities in hoards. It is difficult to estimate the total quantity of dirhams discovered since records started in the 18th century. 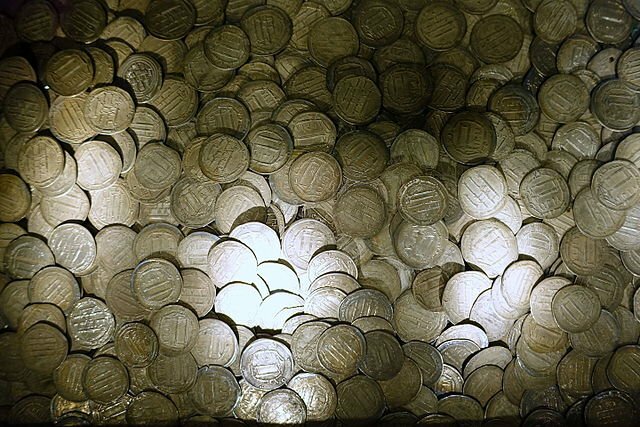 The biggest existing database contains 200,000 coins, but many hoards had been scattered before they could be recorded. Over 1,000 hoards are known, and they may have comprised in total as much as 1 million coins. This is a very significant number. The Islamic dirhams would probably constitute the largest body of statistically usable material for the early Middle Ages that would allow invaluable insights into the history of Eurasia – if only they were adequately published. Unfortunately, no exhaustive list of finds exists for Sweden, the numerous new finds from all over Northern Europe are only exceptionally published, and the immensely rich collections of the coin cabinets in Stockholm and St. Petersburg remain virtually unavailable. Few hoards have been fully studied, and cases such as the recent find of the huge hoard in the settlement of Spillings in Gotland which weighed almost 70 kg, where extensive archaeological excavations have been conducted on the find spot, are exceedingly rare. The dramatic increase in new finds brought about by metal detecting goes hand in hand with the shrinking number of specialists capable of documenting them. Overall, it is probably fair to qualify the research on the Islamic coins in Northern Europe as moribund.